Multiple scenes of Sherman County, Kansas. Included are scenes of a train wreck May 2, 1913, near Colby, Kansas, and the First Methodist Episcopal Church in Goodland, Kansas, with an inset photo of the pastor Rev. J. R. Thomas. 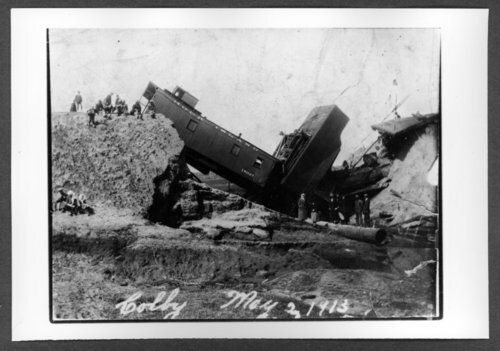 Scenes of Sherman County, Kansas - Wreck on Rock Island Railroad caused by washout, Colby, Kansas, May 2, 1913.